Most States Punt Health Exchanges To The Feds : Shots - Health News Only 17 states and the District of Columbia have proposed running their own insurance markets. Experts had expected mostly small states to seek federal help, but some of the nation's largest have said they will not run an exchange on their own. Gov. 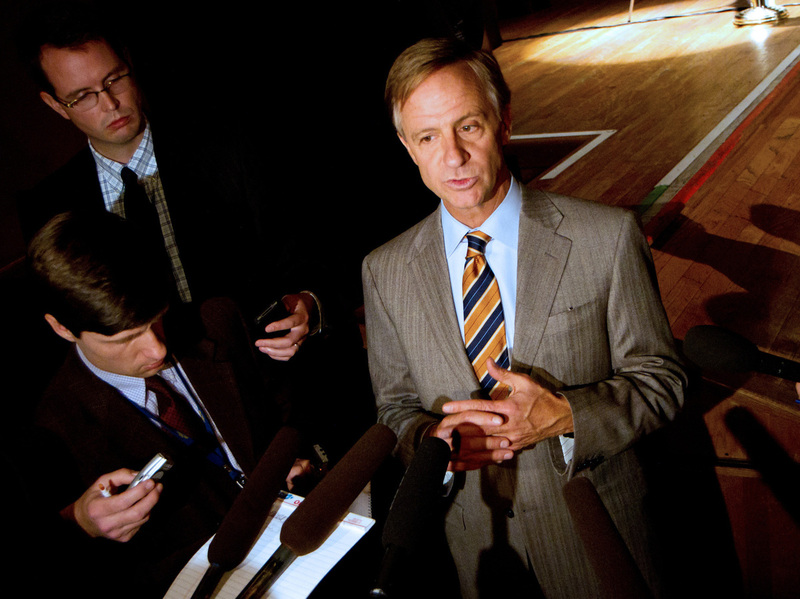 Bill Haslam speaks to reporters after announcing in Nashville, Tenn., on Monday that that he had decided against creating a state-run health insurance exchange. The Republican governor said he will leave it to the federal government to run the marketplace. Few people expected that the Obama administration would be running health exchanges in more than 30 states when the federal health law was signed two years ago. But with the deadline for states to decide just hours away, only 18 states and the District of Columbia have proposed operating their own insurance marketplaces. The exchanges are a key tool under the law to expand health coverage to an estimated 23 million people over the next four years. "Most analysts did not anticipate that the federal government would end up playing such a big role in the operation of exchanges nationwide," said Carolyn Pearson, a director at the Washington, D.C., consulting firm Avalere Health. The option to have the federal government run the state markets was seen as a backstop when the Affordable Care Act was signed. Administration officials have repeatedly said they hoped most states would run the markets themselves because they know their insurance markets best. Only states with small populations such as Delaware or Montana would seek federal help, thought most experts. Instead, the majority of states will rely on the federal government. They include two of the most populous: Texas and Florida, which together account for nearly 20 percent of nation's uninsured. By law, the state exchanges must be approved by the federal government by Jan. 1, begin enrollment next October and have coverage take at the start of 2014. Administration officials say Americans can be assured the markets will be available in every state next year for people to compare and buy coverage. This week, eight states — Colorado, Connecticut, Kentucky, Maryland, Massachusetts, New York, Oregon, Washington and the District of Columbia — were given federal conditional approval for their exchanges. Most with states with Republican-led governments have opted against running an exchange, although Idaho and Nevada this week said they would seek approval. States that don't run their own exchange have two options: a federal exchange that needs little state participation or a federal partnership exchange, in which states help by performing certain duties such as providing customer service. States have until Feb. 15 to say whether they intend to seek a federal partnership exchange. Five states, including Iowa, have done so already. "I don't envy ... [federal regulators] for the job that they have," Dennis Smith, the top health official in Wisconsin told a congressional committee Thursday. Wisconsin won't pursue a state exchange. "At the end of the day, you're trying to connect a buyer to a seller. And the fundamental things required to do that are not yet in place," he said. "It is going to be a sprint for government officials and the industry to be ready by next fall," Connolly said.